For the past week, I've been having "Alice" flashbacks. 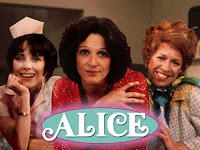 Alice was a sitcom which aired from 1976 to 1985 on CBS television. But my reasons for the flashbacks are actually more concrete. This evening, Turner Classic Movies actually ran the 1974 movie "Alice Doesn't Live Here Anymore" which was a very early Martin Scorsese flick, upon which the sitcom was actually based (it seems scary to me that movies from the 1970s can be considered "classics" because I'm used to classics being exclusively in black and white, but at some point, this was bound to happen). 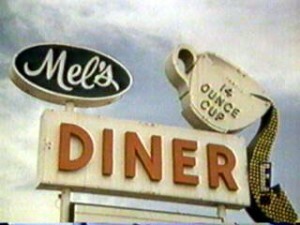 Although the star of the television show, Linda Lavin, was not featured in the film, the guy who played the Phoenix diner-owner Mel Sharples (played by the now-deceased actor Vic Tayback, who starred in the movie, and later reprised his role in the film for the TV series) where Alice was employed was the same guy. Basically, it was about a widow named Alice Hyatt (and her son Tommy, played by Philip McKeon on the TV show, whose older sister Nancy played "Jo" on another '70s show called "The Facts of Life") who leaves New Jersey to go to LA so she can pursue a singing career (catch this 1978 issue of People magazine for Linda Lavin's cover story) But her car breaks down unexpectedly near Phoenix, and since she's out of money, she ends up taking a job as a waitress at dump diner known as Mel’s Diner in the Phoenix outskirts. Actress Linda Lavin, who in recent years has been largely absent from TV reportedly lives in North Carolina these days, but she continues to act, albeit only periodically, and mostly in stage productions (including one running on Broadway as I write this). Last week, my Netflix queue delivered the recent Jennifer Lopez flick "The Back Up Plan", and I was kind of surprised to see Linda Lavin starring in that particular movie as the lead character's mother. I envisioned her in an ugly polyester diner uniform (the kind common back in the '70s), only these days, Ms. Lavin's hair is white in color. But aside from the hair color, she looked ... and sounded ... exactly the same. Anyway, the website "Sitcoms Online" is reporting (see HERE) that the '70s-'80s TV show "Alice" (at least the first season) is likely to be coming to DVD! While it doesn't explicitly say so, there was news that the first season will be available to purchase to view streaming on your computer (or Roku device) from Amazon Instant Video. They also discuss the wording from the studio, which I'll get to shortly. I should take a step back to note that Warner Brothers has a somewhat unique capability known as "DVD on Demand" (also known as manufacturing on demand) which enables people to buy DVDs from the Warner movie archives (which have been digitized) without the company having to manufacture a lot of the products (you can visit Warner on Demand by clicking HERE) in advance. They also produce DVDs on-demand for rival Sony, and importantly, they do it for Amazon.com. To date, it's mostly been used for classic movies, although more recently, they've introduced some classic television (for example, some later seasons of the '80s TV show Night Court can be bought there). While the service isn't cheap, the prices are comparable to what a full season from a TV show would cost, and they occasionally do sales. 'Things are looking good for ALICE. Stay tuned!'" Apparently, the wording on the news was written in such a way to suggest that manufacturing on demand for season 1 of Alice might be in the cards, although its still no guarantee at this point. Technically, Warner Brothers did already release a single DVD of what they called "Fan Favorites" for Alice which featured 6 episodes (that disc is apparently out-of-print, but is still widely available from places like eBay and even some retail stores), but for a show that aired on TV for a decade, that was hardly enough. Just when will Alice Hyatt and company (including co-stars Polly Holiday as Flo and Beth Howland as Vera) will be available? Well, the details have yet to come out, but the best place to keep abreast of it is at TVShowsonDVD.com (which is owned by TV Guide, incidentally) which has a TVShowsonDVD release calendar, and they also have an RSS feed for regular news updates on the subject of television shows on DVD, or you can query on the status for a particular show. Author P.S. (June 12, 2012): Indeed, my sources were correct! As of today, Warner Archive's Manufacture-on-Demand began selling "Alice" Season 1. Visit HERE for details. The Warner Archive Collection Podcast dated June 12, 2012 is entitled "New Releases: There's a New Clown in Town" and can be found on iTunes HERE, or you may just listen to the MP3 HERE. Author P.S. (October 23, 2012): Warner Archive is releasing "Alice" Season 2 starting today for $29.95 + shipping and handling. It will be available as a manufacture-on-demand product, much the same way as Season 1 was offered. To order, visit http://www.wbshop.com/ and click on "Warner Archive".